Russian vineyards are witnessing a quiet renaissance, and wine produced in the country is even comparable to French or Italian varieties. If Russia is not known as one of the world’s best wine producers, it was traditionally for good reason. The country’s wine has endured a torrid reputation since Soviet times, when products were typically oversweet and unsophisticated. Moreover, demand for wine in Russia has never been especially high, and these attitudes are borne out by statistics. According to data provided by state statistics service Rosstat, wine only comprises 8.5 percent of the total volume of alcohol sales in the country. As long as the domestic market is unsaturated, Russian wine will remain difficult to find abroad. At present only a few relatively large operations export their products, and then only in small batches meant primarily for marketing. For instance, the Abrau Durso factory delivers around 150,000 bottles of sparkling wine, which comprises less than 1 percent of its sales in Russia. The wines of Abrau Durso can be purchased in Great Britain, Hungary, Finland, Denmark, Israel, the Baltic States, Belarus, Kazakhstan, and other republics of the former USSR. 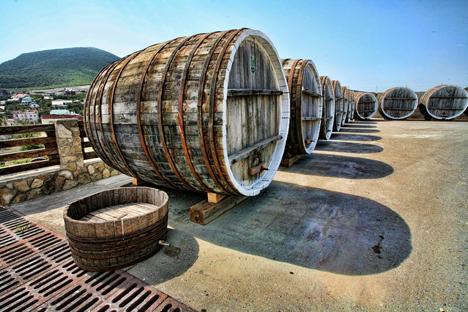 Tsimlyansk Wines only exports about 120,000 bottles to Russia’s near abroad – Lithuania, Kazakhstan, Poland, Ukraine. Fanagoria, meanwhile, exports a small quantity of its production to Japan and the USA. Pavel Titov, chairman of the board of directors of the Abrau Durso Company, is bullish about the prospects of Russian wines in the coming years. “We would very much like wine from Russia to become an internationally recognized brand. The quality potential of Russian wines is such that it will eventually be possible for them to compete with wines from the old and new world,” says Titov. Will there be a boom in Russian winemaking? Wine expert and head of the Russian Sommeliers' Union Artur Sarkisian has now created a guide to Russian wines (it is available in Russian and English in print and electronically). The expert emphasizes that although it is his personal selection, all the wines sampled for inclusion in the guide underwent double tasting – first at the vineyards and then in bottles bought in ordinary shops. The review for 2014 features wines from several parts of the south of Russia, including products from 14 wineries in the Don Valley, as well as from five districts of the Kuban region. At first glance this seems an insignificant figure, but the value of many samples is in their use of indigenous vine varieties. This means that wines such as Krasnostop Zolotovsky, produced by the Vedernikov winery, for example, cannot be sampled anywhere else in the world. The dozens of wines presented in the guide provide a selection of appropriate choices for any refined table. The Saperavi from Fanagoria goes wonderfully with meat, the Riesling from Abrau Durso goes well with fish, and the Tsimlyansk Grand Reserve is good served with game. The Raevskoe winery’s Renaissance sets off the flavor of cheese, while Fagotin from Chateau Le Grand Vostock is a perfect choice for the dessert table, and the author recommends Liguria Reserve from the Lefkadia winery as an ideal accompaniment to oysters. The majority of these beverages are indicated in the guide as “wines of geographical appellation”. This is a conditional characteristic which will correspond to the European category “indication géographique protégée” as soon as the classification of Russian wines is legislated. The category “controlled designation of origin” (corresponding to the French “appellation d'origine controlee”) is still being developed. The guide also discusses the phenomenon of “garage” wine-making – small winemaking operations usually situated in the south of Russia. These cottage industries produce no more than 0.05 percent of the total volume of Russian wine but are greatly valued by wine experts for the brave experimentation they embody. Thanks to these “garagistes” a trip to southern Russian has the potential to become a fascinating wine tour, taking in wineries both big and small. Many of the large wineries also have interesting pasts, adding a fascinating historical dimension to degustation. Fanagoria is located on the grounds of the ancient city of the same name, adjacent to a large archeological excavation, Alexander Pushkin mentioned Tsimlyansk wines in his works, and Abrau Durso was Nicholas II’s favorite champagne.